Doll Factory | www.dollfactory.org | official web site of the band Doll Factory » blog archive » Want. 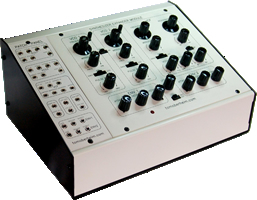 A no-MIDI-onboard version with patch points already handily broken out into a side panel as standard, and it’s cheaper than the version with onboard MIDI and only one extra (other than the obvious keyboard-to-oscillator-pitch one) CV-controllable destination, and it’s cheaper than the Analogue Solutions Telemark? Oh yeah.